Our modern Private Workspace Pods provide places to get away without leaving the office. 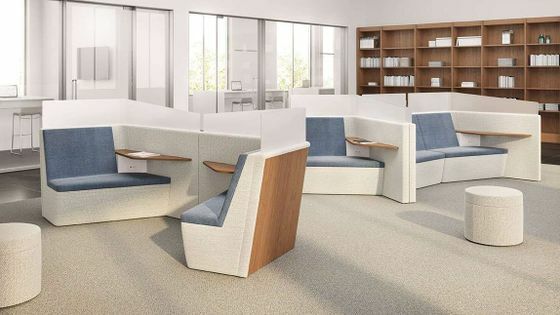 Intuitive to understand, specify and use, this high-back Lounge Seating and Office Pod system creates a plethora of planning options with 4 basic models. Standard features like integrated power, tablet arm, and a privacy screen make specification simple. Material options to express individuality include veneer or fabric back options, non-woven PET or acrylic privacy screens. Highly adaptable and versatile, this modular lounge seating design can be configured to support individual work, touchdown and collaborative spaces, along with conference environments.